On the schedule page go to lower left "preferences" select "Monthly". Here are a few samples of projects I have produced. To Purchase any of these just click on the "Buy Now". 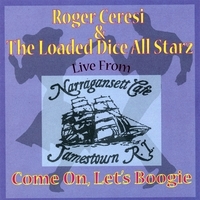 "Roger Ceresi & The Loaded Dice Allstarz"
John Abrahamsen-tpt, Barry Fleisher-ts+bs, CQ-tb. Jimmy "T99" Nelson's "The Legend" on nettie marie records. This new CD has been getting rave reviews across the country. Chicago Sun Times called it "the feel-good blues album of the year"
this labour-of-love production is certainly on its' way to major Award nominations.."
from the December '03 recording at the Mediator in Providence, RI. John Abrahamsen-tpt, Barry Fleisher-ts+bs, Doug James-ts+bs, CQ-tb. Sugar Ray Norcia's "Sweet and Swingin" on Bullseye Blues. Marty Ballou-bs, Neil Gouvin-drm, Gregg Mazel-tsax, Doug James-bsax, CQ-tbone. Porky Cohen's "Rhythm and Bones"
Ken "Doc" Grace-bs, Tom Reed-bs, John Rossi-drm, Ray Norcia-voc, Michelle Wilson-voc. Jimmy "T99" Nelson's "Rockin' and Shoutin' The Blues"
CQ-tbone, Matt McCabe-pno, Marty Ballou-bs, Neil Gouvin-drm. "T99" Nelson's "Take Your Pick"
Matt McCabe-pno, Marty Ballou-bs, Neil Gouvin-drm. Roomful of Blues; "Dance All Night", "Turn It On Turn It Up", "Roomful of Christmas", and "Under One Roof"
Mark Taber on piano and Marty Ballou on bass. A fantastic, fun CD!! Doug James-bsax, Mark Taber-pno, Ken "Doc" Grace-bs, Joe Groves-drm. And this little gem here from the group Loaded Dice, with whom I worked for many years. Rob Nelson-gtr, Bob Soiot-drm, Vin Earnshaw-bs, Peter Shonk-Voc, Harp, Slide gtr. Brass players doing their part to stem the rising tides. $7.50 plus $2.50 shipping and handling. You can find a complete discography at All Music Guide just enter my name in the search window. There is also a short bio at the Trombone Page of the World.